Coming up: check out the view of Mars, the reddish-orange object, just below the constellation Leo. 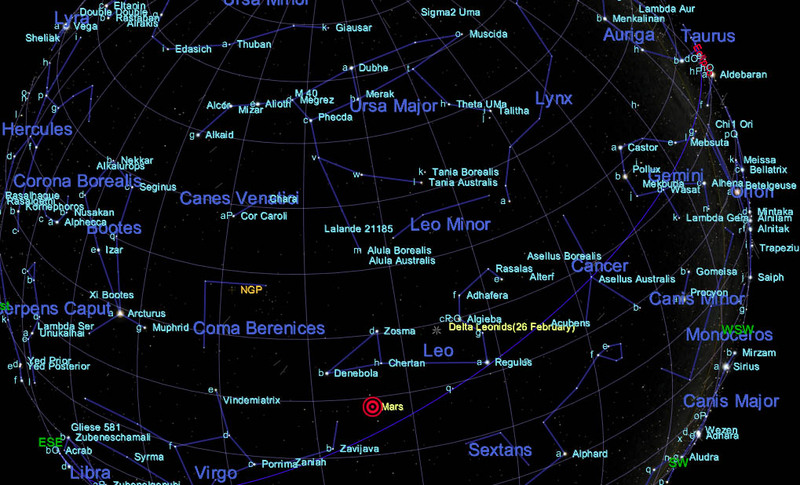 Mars will be making its close approach between February 24th thru about March 9th or so. Daily observing of the 2012 Mars close approach will occur at Kopernik Observatory & Science Center, clear skies permitting. Check out the event info here. For those of you advanced astronomers with high end equipment, check out this challenge by Astroguys.com to spot the Martian Moons Phobos and Deimos – http://bit.ly/wDbUai.